There is endless internet talk about the pros and cons of mothers who decide to stay at home, work at home, or head back into the work place after their babies are born. It is such a personal decision and one that comes with a lot of judgement no matter what you decide. For me the decision to stay at home came fairly easy when my daughter was born almost 5 years ago. But I have recently transitioned to a work at home position and I’m still working out the kinks. Before I was married, I seriously didn’t know if I wanted to have children. Those of you who know me best would be surprised to find out this information since I clearly have embraced my role as Mom. I worked as a Client Relations Specialist for a Technology Research company for 5 years until two days before she was born. I had also been working in membership at the Boston Museum of Science part time on weekends. The decision to stay there part time after leaving my full time position was a good way for me to still get out and make a little bit of money to support my spending habits. Some people ask if we did any major saving or made changes to our lives to prepare to be a one income family. We honestly did not but knew things would change a whole lot in the time ahead. We went out less. I didn’t buy new shoes as regularly. My commute was no longer an expense. And we became more aware of ways to cut back on the everyday things. This was not easy, but you make it work. I have to give credit to my amazing husband who has always worked extra hard and has been successful in his career. He truly keeps us in check financially as best he can and I am so grateful to have been a stay at home mom. And I honestly never once missed corporate life. Being a stay at home mom (SAHM) gave me the chance to make mom friends in the area that I truly could not survive without. I actually met them online! I feel like I have become a better cook and have had the chance to dive into a role as teacher to my children in so many ways. When my son came along two and a half years later, working full time was no longer even something I would have considered. I give so much credit to those moms that juggle the mornings, the drop offs, the commutes, the pick ups and then the family stuff at night. Sadly, I also feel like people view a SAHM as someone who sits around watching four hours of the today show while keeping a perfect house full of mannered children. Sure I spent some extra time watching television the first time around in those few weeks where all she did was eat sleep and poop, but without a doubt in the end – it’s been the hardest job I can ever imagine having. Recently however, I was given the opportunity to take on a member care position and become a work at home mom (WAHM). This has taken some real hard work to transition and I don’t yet feel like I have it figured out entirely. The first thing to take note of when starting any job is how to maintain a work/life balance. Well for me, I struggle with how to still be a SAHM but now WAHM. How am I supposed to tell my kids I can’t play because I am working? What kinds of things need to be put in place to make this kind of thing work? It is amazing that companies have started to consider the real value in using moms to assist in the member care functions of a business. These women are often educated, hardworking, and wanting to contribute financially in some way to their families growth. This was/is me. More and more opportunities are popping up for women to be at home and still earn. I have to say that if you decide to go this route there are some key things to think about. First being that it is key to feel passionate about the company. Make sure you want to be a part of their goals. Staying at home or working at home is not for everyone. I think the key is having confidence in whatever you decide to do. Without that you’ll have a harder time being your best. For me, I have put in for hours that work with rest/nap time in our house. We often have quieter afternoons while my two-year-old naps and my almost five-year-old will craft, play independently or watch a movie. I also have had to up my craft supplies, allow for more movie/tv watching, and be stricter about our schedules in general. My weekly menu plans have increased to ease in not having to struggle with coming up with a meal at 6:00 pm each night. I’m working about 25 paid hours a week and it honestly takes me about 35 hours to do that much work. Fortunately the job is flexible in that it understands I am at home with my kids and that life comes first. Without fail in a given hour someone needs a snack, a bum change, the tv stops working, something goes missing, a boo boo needs kisses, a fight needs to be broken up, something spills, and yet I need to be working. I have had to find a whole new level of patience and, sadly, I have had to realize I just have to go to bed some nights without putting the laundry away. This is not easy when you feel the extra pressure of getting your work/hours in each day as an employee and as a mom and wife. Also, there are tons of resources out there to assist in making a WAHM job work. I recently discovered a useful site, WAHM.com. I have not had nearly enough time to browse the site, but it really seems like a great resource. It is also great to find other mom friends who have made the transition and chat with them or vent with them when need be. Even better, find ways to get them a WAHM job and you can share in helping one another with the kids and with feeling like a part of something when your team is so remote. 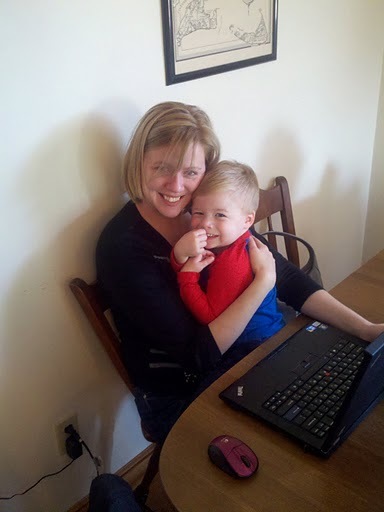 But here is what makes this so great, I get hugs and kisses while I work. Often times I am cuddling while chatting on skype with a coworker. I’m feeling like I am contributing financially to our goals as a family. And the best part of being a WAHM is that I still really feel like a SAHM – and that’s what is most important to me. What an honest and encouraging post. I find being a WAHM and sometimes WOHM (work outside the home mom), while still being a SAHM very challenging some days, but rewarding every day. Finding ways to use my experience and talents to help support my family while keeping the kids as my primary focus (well, at least in theory– sometimes I admittedly ignore them while attending to other things) has been important for my family. Glad to see how you are making it work for yours. Good post. I often think about getting a wahm job, I just don’t know what I could find that would fit into our schedule. I think every mom has her challenges, and you’re right, it’s a totally personal decision. For me, the decision to be a sahm was actually tougher than I ever imagined it would be…but I’m really glad with the decision I made. This is a wonderful post. Though I think parenting is perhaps the most challenging job there is, I think it’s crucial that your children see you as a person in your own right, with your own interests and work to do other than parenting, and not just as their “mommy-servant.” It is also important that you see yourself that way, and that your husband does, too. I look forward to your next post! What an honest and ergcunaoing post. I find being a WAHM and sometimes WOHM (work outside the home mom), while still being a SAHM very challenging some days, but rewarding every day. Finding ways to use my experience and talents to help support my family while keeping the kids as my primary focus (well, at least in theory sometimes I admittedly ignore them while attending to other things) has been important for my family. Glad to see how you are making it work for yours. This is a wonderful post. Though I think panirteng is perhaps the most challenging job there is, I think it’s crucial that your children see you as a person in your own right, with your own interests and work to do other than panirteng, and not just as their mommy-servant. It is also important that you see yourself that way, and that your husband does, too. I look forward to your next post!